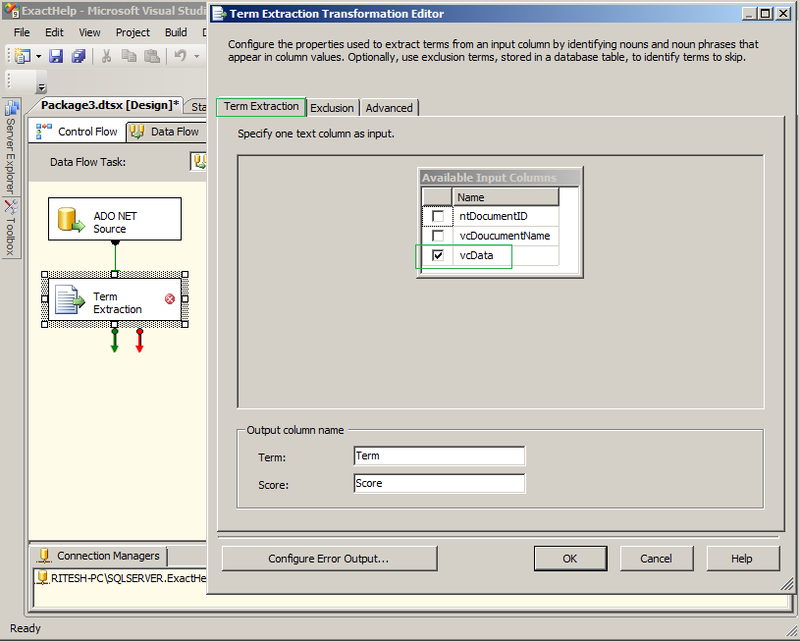 Step 3: Drag term extract transformation and connect with data source adapter. 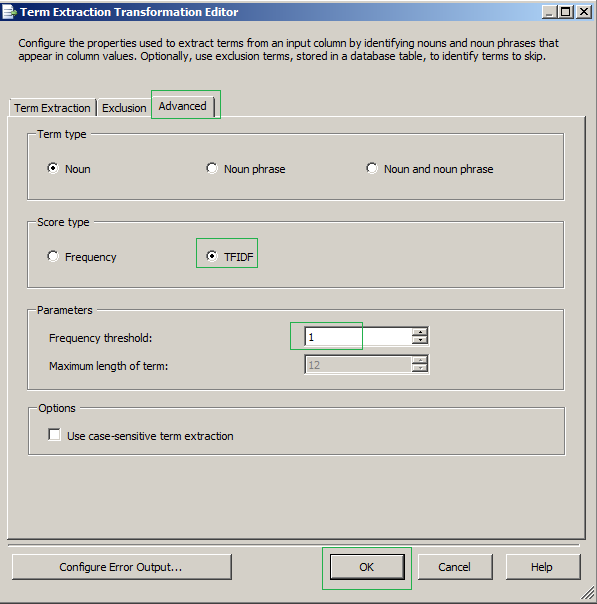 After double clicking it will pop up term exaction transformation editor. Select the any on text data type column from where we want to extract the nouns or noun phrases. Again come back to SSIS. Under exclusion tab, create a new database connect where we have just created a table named "tblExclude". Select the table and column name from drop down. Term type: Noun means a single word noun and Noun phrase means groups of words (Noun, adjective etc.) In this example we are choose "Noun"
Score Type: Frequency means total occurrence of a word. TFIDF is a fractional type score. In this example we are choosing TFIDF. 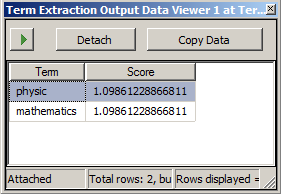 Parameters: Frequency threshold means minimum occurrence of word to exact from text column. In this example we are choosing only occurrence is sufficient. Let's assume we have a table named document. 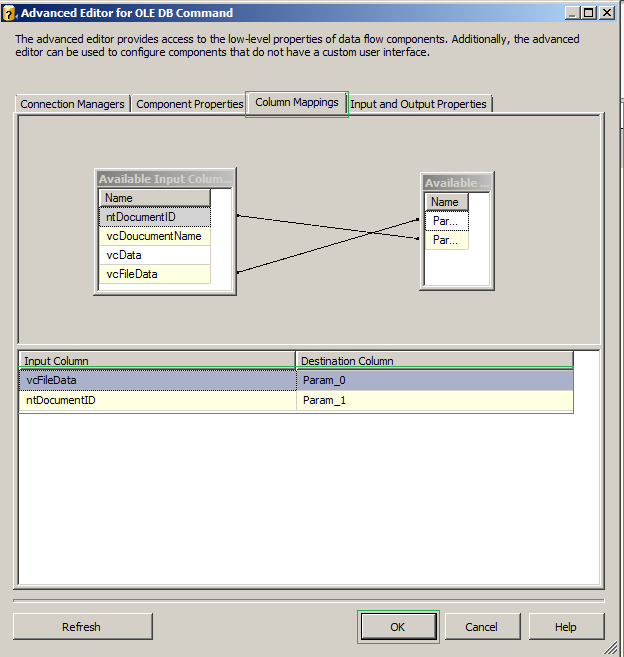 We want to load content of file to vcData column according path specified in other column (vcDocumentName). 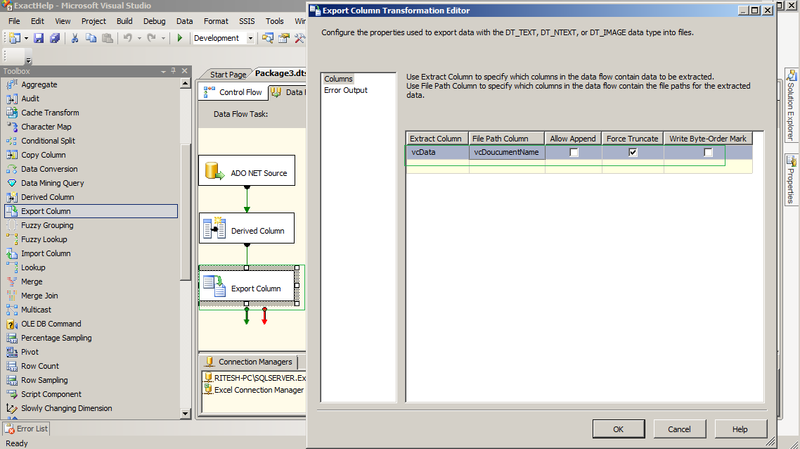 Step 3: Drag import column transformation and connect with derived column transformation. Double click on it which will pop up advance editor. In Input columns tab select column which keeps file path. Step 4: Now click on input and output properties tab. 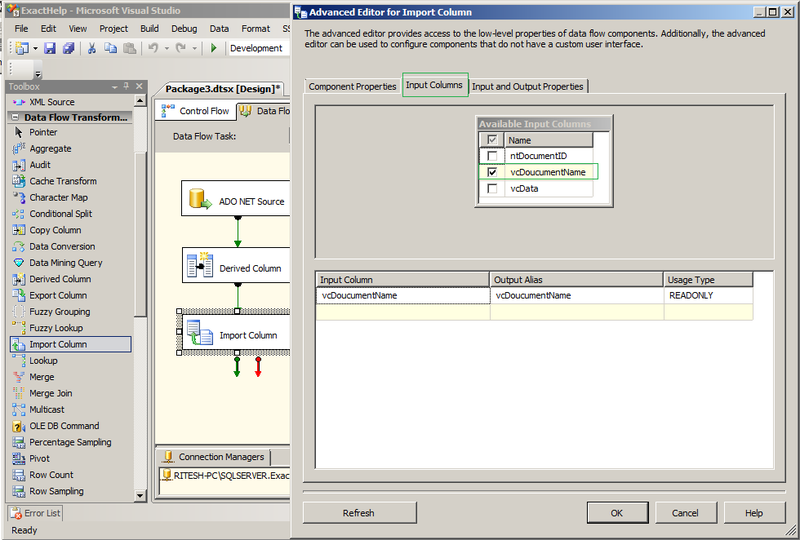 In the output Columns node add a new column. 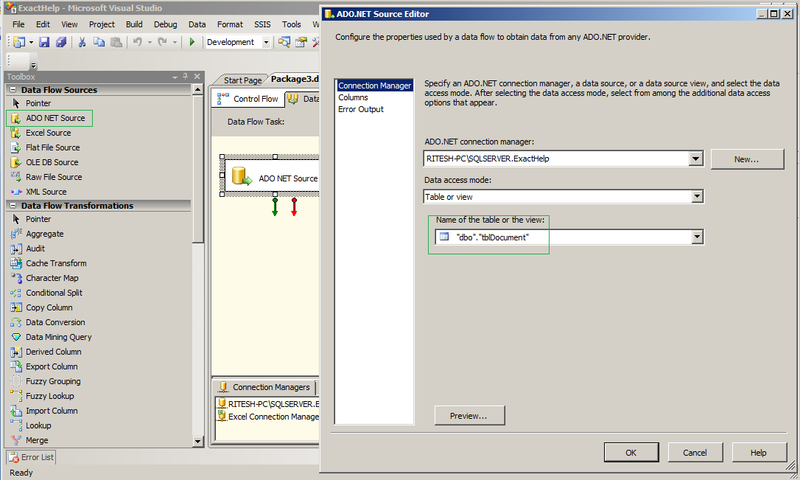 In this example it is vcFileData and selecting DT_NTEXT as a data type from drop down. Copy the LinenageID which is 297 in this example. 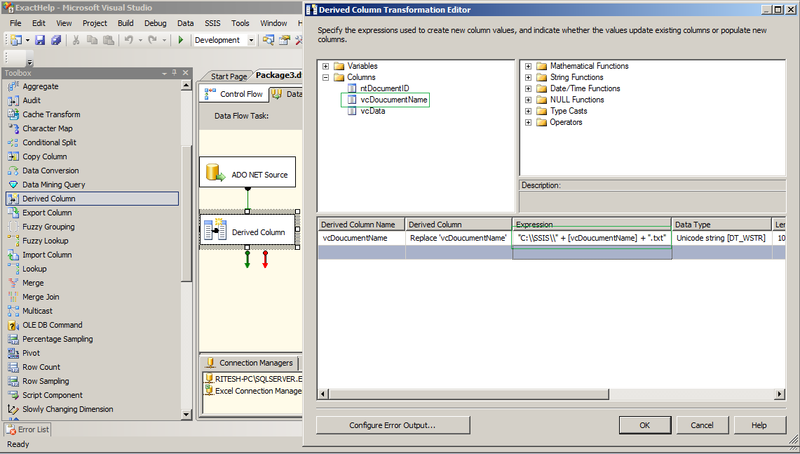 Step 6: Drag OLEDB command and connect with import column transformation. 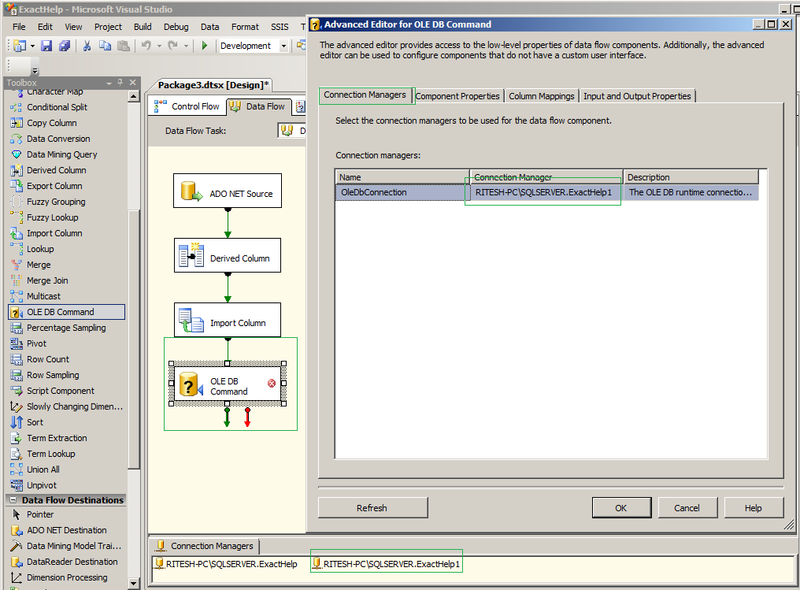 Create a new OLEDB connection. 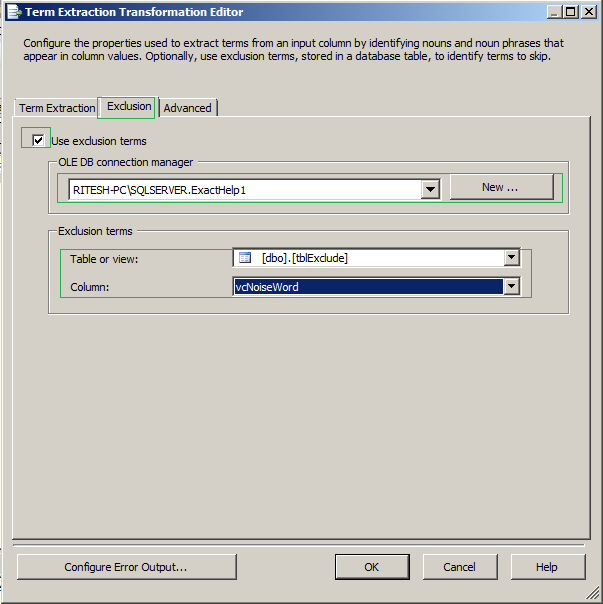 Double click on OLEDB command transformation. Under the connection managers tab select new OLED connection from drop down. 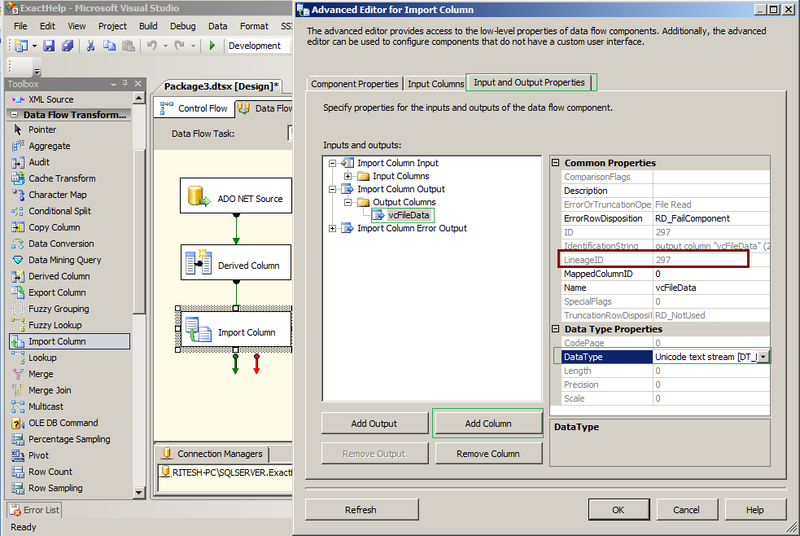 Step 8: Under column mapping tab, map the destination column with input column. 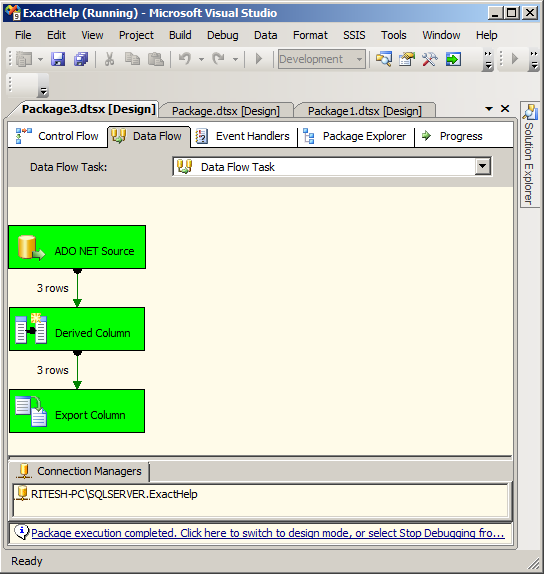 Step 9: Now execute the package!! 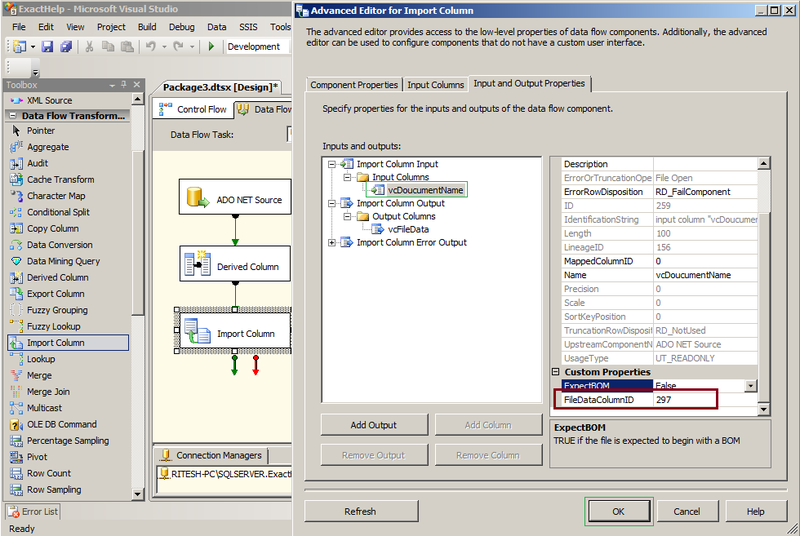 Extract column: From drop down choose a column which keeps content of file. 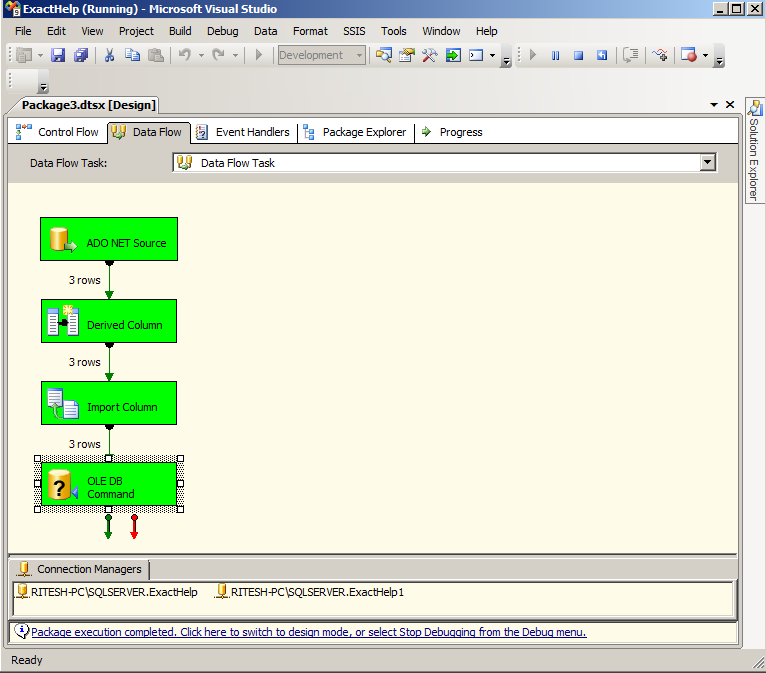 File Path column: from drop down choose a column which keeps physical path of the file. 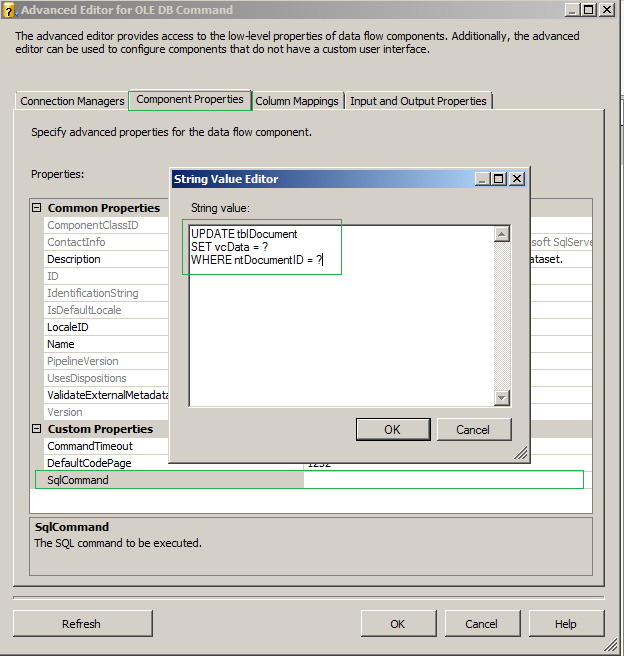 Allow append: If it is selected and file is exists then it will appended the data in same file. Force truncate: If it is selected and file is exists then existing will be deleted and a new file will be created.